Original, patinated, atelier, presentation plaster, shown at the New York Armory Show in 1913. Signed on rear of right shoulder: R. I. AITKEN. Provenance: Estate of an American living in Paris. 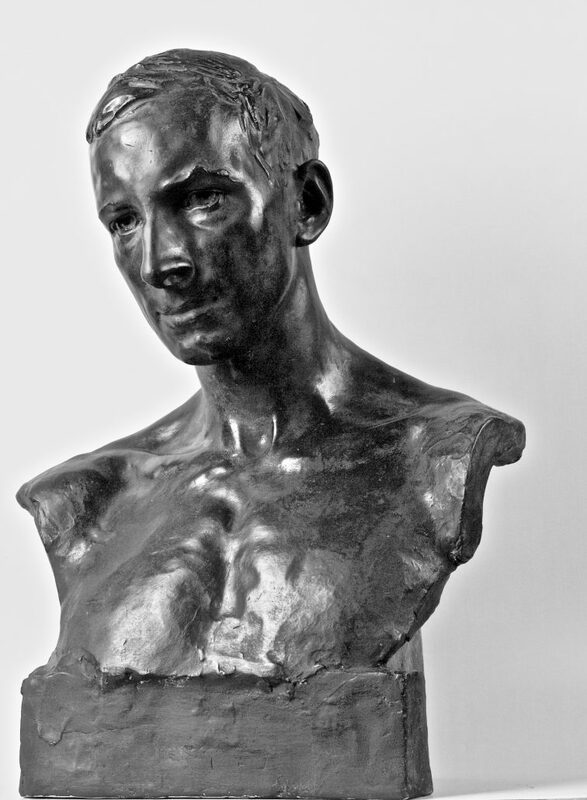 San Francisco born Aitken had only one year of formal art training with the sculptor, Douglas Tilden. Exceptionally gifted, by the age of eighteen, he had already set up his studio in the San Francisco area and received several important monumental commissions. He worked in Paris for three years, from 1904 – 1907. Traveling back to the U.S. in 1907, Aitken settled in New York and taught at the Art Students League. From that point onward, he enjoyed a steady succession of public and private commissions: (the Panama-Pacific International Exposition, where he designed the $50 dollar coin, the American Federation of Labor, the United States Supreme Court Building) a plethora of awards: (from the National Academy of Design and the Architectural League of New York) and prestigious posts: (Academician and Vice-President of the National Academy of Design, President of the National Sculpture Society, Vice-President of the National Institute of Arts and Letters.) Aitken’s style was inspired by classical and Renaissance models, but it was also representative of a turn-of-the-century predilection for naturalism in America. George Wesley Bellows (1882-1925) began exhibiting paintings in 1907 and became an associate member of the National Academy of Design in the same year as Aitken. Bellows, then twenty-six years old, was the youngest painter to receive such a distinction. Early in his career, his paintings were acquired by the Pennsylvania Academy of the Fine Arts and the Metropolitan Museum. Bellows taught at the Art Students League in 1910 and 1911. The sensitive likeness achieved by Aitken was fashioned during a period of friendship and professional association forged between the two men. Aitken, who specialized in life-like portraits of artists and writers, captured the painter’s unusual physical characteristics, what Frank Crowninshield would later describe in the Bellows memorial exhibition catalog of 1925, as his “ tall, shambling and a little ungainly” appearance. The Metropolitan Museum and the Columbus Museum of Art conserve posthumous bronzes of the model, cast by Roman Bronze Works in 1951. In terms of size and form, the present plaster example corresponds exactly to the plaster in the National Portrait Gallery, Smithsonian Institution, which Aitken gave to Bellows (inventory number NPG.97.4.) Ours, located in the estate of an American residing in Paris, was the presentation cast shown at the New York Armory Show of 1913, under N° 686. and acquired directly from Aitken. According to Milton W. Brown’s book, The Story of the Armory Show, in 1963, at the time of writing, the plaster belonged to the Honorable and Mrs. John Hay Whitney. Both the Smithsonian version and the present plaster are cast in a single piece. They differ significantly from the posthumous bronzes, in that they retain their original plinth and are taller in height by more than eleven centimeters. As such, they document the New York Armory Show version that was originally presented by Aitken in 1913. 1. American Sculpture in the Metropolitan Museum of Art. Vol. 2. A Catalogue of Works by Artists Born between 1865 and 1885. Metropolitan Museum of Art and the Yale University Press. 2001. Pages 625-626. 2. Milton W. Brown. The Story of the Armory Show. The Joseph Hirshhorn Fundation and the New York Graphic Society. 1963. Page 220. 3. Information communicated by courtesy of the National Portrait Gallery, Smithsonian Institution.